Following a hugely successful debut for John Lewis in 2011, Royal designer Nicki Macfarlane has created a new, exclusive collection for the retail favourites. Featuring muted colours of shell pink and elegant ivory; full skirts with petticoat underlays and Nicki’s trademark sumptuous bows in royal gold, ivory silk and organza, the range of five dresses epitomizes Nicki’s reputation for exemplary quality and style. Here you can see the ivory 1950s-inspired Hera (far left) which has an on-trend belt with a bow at the front and is perfect for all ages of flower girl. 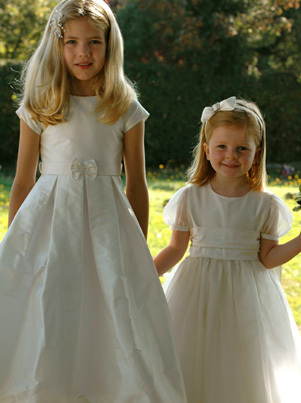 The dresses are available from aged 3 to ten. On the left is Juno, a fairytale dress featuring organza overlaid on silk and delicate organza sleeves and a dupion silk sash – definitely the stuff of little girl’s dreams. The new collection will be in store and on-line at the end of January 2012. Prices start at £210.